I can't be not modelling for long. I get restless and start looking around for something to do. So . . . . . . . . . . . . . . . I thought I'd try something I've been meaning to do for a while... OK, a long time... Oh, all right then, forty odd years! Still on the theme of the bulletproof Tri-ang toys, a close friend of mine passed away recently and his partner has very kindly given me his old toy train collection to make a layout for Charlie. It's good to see the old Tri-ang stuff used to make a proper layout as opposed to just sitting gathering dust on a shelf or getting ruined in a cardboard box under a second hand stall at successive model railway shows......a nice memorial to a friend as well. A friend of mine collects Tri-ang from that era, I think he is 3 or 4 years older than me and so it would have been a bit more current when he was a nipper. I dimly remember having a few odd bits of super4 track but that it wouldn't join up with the rest I had (system6?) and also a mix of Tri-ang and H-D stock with incompatible couplings.......still, at least the H-D was 2-rail! Easily distracted? Me? Oh Yes! Tracklaying now completed and the worst of the rust removed from the railheads. One advantage of steel track over nickel silver is that I won't have to paint the sides of the rail rust coloured, they look very realistically weathered now the running surface is bright! The acid test for any sectional layout is the first time you take it apart after laying the track or, moreover, the first time you put it back together again! Princes Road was dismantled yesterday morning so that I could fit some battens to the underside of the end baseboards, thus enabling the layout to sit on my paste table without any additional support. I'm glad to say it went back together perfectly. The next task is not one I'm looking forward to. It's going to take a lot of dropper wires to ensure that the current gets to all the track sections directly because I don't trust the old fishplates to do the job and even with flux I always find it difficult soldering to steel. Very impressive board segmentation, Bob. I'm not confident I can drill dead level to get dowels to locate properly like that. Do you use a jig, or is it just by eye? Do I detect some new track in the middle distance - could it be narrow gauge (in your case I suppose Triang TT)? If so it would be an interesting development - and the same way I started to go n.g. in the late 1960s. Not my woodworking Giles, it's square for starters which is a good giveaway, my joinery seldom is. The new battens I've added underneath also act as supports/alignment for the middle boards, which sagged slightly as I was hammering in trackpins, but the main framework was bought a couple of years ago as a large scale project that never took off. There are some narrow boards left over which might get used for a future On18 or American N gauge project. See the link below. The isolated tracks in the middle are standard gauge. The branch is in effect two SLTs back to back and the industrial sidings are a tuning fork but as this is out of reach for the kids I suspect it'll be modelled as a scenic feature rather than an operational one, at least for starters. We can always revisit it at a later date if Charlie takes an interest in shunting. You can use a jig, this can be very useful if you are putting the dowels in if they have been left to last for one reason or another. There is another simpler option, BUT THIS MUST BE DONE AT THE START OF CONSTRUCTION. Securely clamp together the wood battens or plywood, which you intend to be the ends of the adjoining sections. (Ensure the tops are level) Mark which way up they go and which side should join to the other. Then mark the holes for the alignment dowels and the bolt holes. They can then be drilled and will automatically align with each other. The engineering term for this process I believe is Matched drilling. It is a lot easier than trying to accurately drill each one separately. The easiest way to ensure a truly vertical drill hole is to use a drill press. These need not be fancy, the simple ones to use with normal Black & Decker drills and others are more than adequate. These can often be picked up at boot sales, mine is a tatty example with peeling paint which I picked up for a quid. I have to admit that I had some doubts about the viability of building a layout with such rusty track, but they were unfounded! They never went away, Simon........mine powered the Cattewater & Southern and provided 16vAC for other layouts before and since - and probably the next, too. As far as nostalgic sounds go, do I detect knurled bogie wheels under the dmu, Bob? A very Triang sound, even better under their old SR emu which whined just like the prototype (remembered from early days commuting to school). By the way, what's that little diesel outside the loco shed? It is, knurled wheels on steel track pinned directly to the baseboard. I don't do DCC sound, no need to when the trains make that much noise of their own. It does actually remind me a bit of the first generation units that worked out of Longsight and Newton Heath in the seventies, they used to make some pretty odd noises at times. Talking of odd noises, listen to whine of the the turbo charger... Errm, sorry, I'll type that again... Listen to the whine of the Lima pancake in this 37 as it drags the Pullman around the inner loop. I know, nothing like a tractor but Charlie loves it and just imagine how much louder it's going to be once I've ballasted the track. The rat's nest of wiring will be re-routed under the baseboard, it's just a temporary arrangement at present to get things running for sprog MkII's benefit... and for me to play with as well of course. Noisy..........and fun! Takes me right back to the start of the 1960s. Ballast's a bit modern for a retro layout, isn't it? I seem to recall that foam underlay was pretty much the thing - on train-set type layouts, anyway. Look at almost any RMs from the 1959-1964 era. I'm not sure what happened to my Clipper, Giles. A lot of stuff has vanished in house moves over the years so; thinking back I can't remember it much after the 1980s so it may have gone about then. Mmmmmm......sound etc........personally I prefer to hear the sound of a model's motor(s) and let imagination fill in the rest to having DCC sound fed to me. Perhaps my jaundiced view is partly due to the Hornby "Hall" I had in my yoof that had the "state of the art" sound system fitted to the tender and consisted of a strip of sandpaper or similar which rubbed against a cam on one of the axles if I remember rightly. This, of course, sounded like....errrm......a strip of sandpaper rubbing against something......so it got removed! Foam underlay....I think my Dad fitted this to the 00 layout he built for me before he left. Seem to remember the foam went all brittle and broke up eventually. I did try it on my Z gauge layout but wasn't too impressed. Good grief, the "chuffing" tenders! I had forgotten about them. Chuffing was probably a euphemism for something else, especially when the sound thing created more resistance then the rail/wheel interface so it kept stopping. A bit like later tender driven locos which happily skated along the track without the driving wheels revolving. Ballast, one of my all time favourites from old editions of Railway Modeller was Leighton Buzzard Linslade, which I had the great pleasure of seeing at Wells in August. The scenic work on this layout was way ahead of its time - though admittedly now looks a little outdated. As Princes Road and my retro SLT use much coarser scale track I was planning on using birdgrit from the petshop on both layouts. Not only a damn sight cheaper than scale ballast but also something that has been around since before we had toy trains. As for the foam underlay. I tried that when I was a kid and soon found out that it was more trouble than it was worth. Knowing what my three are like I'd say that they'd probably start shredding it before long. Also, was it available for Super 4? I used it with System 6 in the 70s but can only remember using Super 4 on plain grey painted baseboards. Got an intermittent problem with the turnout on the inner circuit, there appears to be no electrical continuity at the frog end of one of the blades so it's relying on contact at the toe end to make the blade live. Might have to replace it with the turnout from the disconnected sidings but I'll need to test that one first, no point in replacing one faulty turnout with another. I think you're right, Bob. Now I think about it, I don't think Triang did produce a foam ballast underlay. My Triang layout (operating approx. 1959-62) started off with series 3 track and was extended using Wrenn track with overscale fibre sleepers and really awful (in retrospect) pointwork where the whole blade right up to the frog pivoted. The advantage was it would take the over-scale Triang wheels. 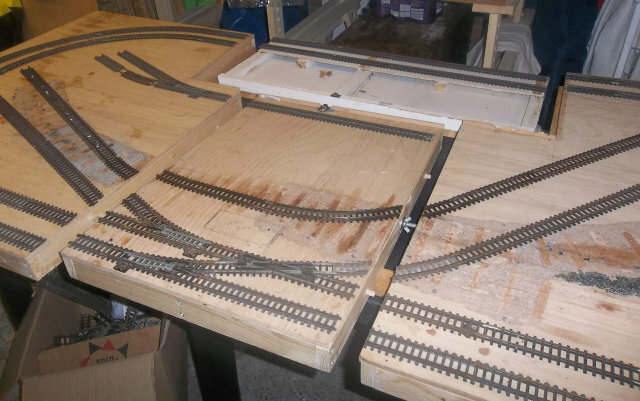 I used Wrenn foam underlay on this layout as I recall. For my next layout (c. 1963-64) I used GEM track which looked a lot better. I did contemplate Welkut track - remember that, anyone? According to ads in Model Railway News you could send off 6d and get a sample length about 3 inches long. I'm not sure if they did points - perhaps you had to build your own, which was probably the reason I never used it. After that I was a committed narrow gauge modeller with an OOn3 layout until I left the parental home - GEM TT track and some with rail spiked to balsa sleepers. Happy days.